Sicilian drivers may suddenly stop in the middle of the street and start conversation with the friend they spotted in a café. Do not get angry, “gently” using your klaxon try to remind him/her that this is not the parking lot. Avoid driving in the city during rush hours (to make it worse, in Sicily rush hours are also when mid-day’s siesta starts and ends!) ! If you have to, then just be ready for long lines of cars and hordes of “two-wheelers” in between…. Pay attention to Limited Traffic Zones (ZTLs). 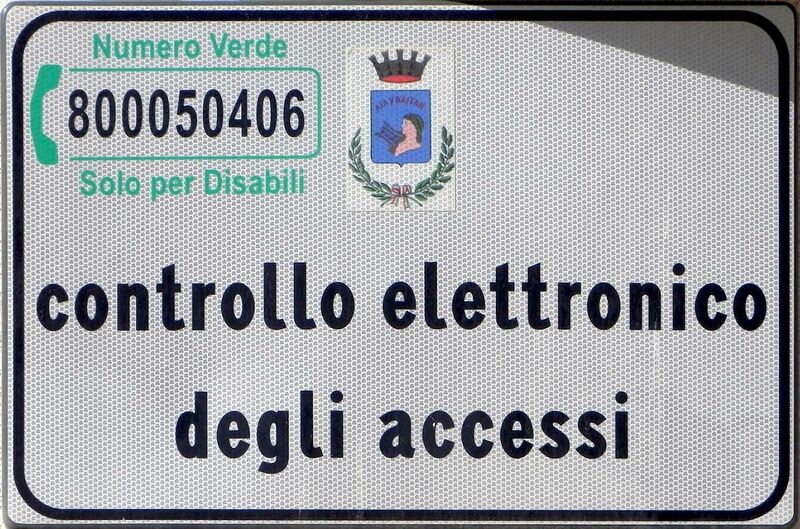 Access by car requires special permission (for example local residents, people disabled and “privileged”…). I’m sure you do not belong to the first group, do not wish you to be part of the second one and when it comes to privileges – if you forgot, let me kindly remind you: you left them home! Be aware that access to ZTLs is monitored by cameras. Leaving or coming to the new city has to be carefully planned (GPS may not help). In other words - select the itinerary through the town prior to hitting the streets. In practice, it should not be the shortest way, but rather the trouble-free one, easy to memorize and follow. 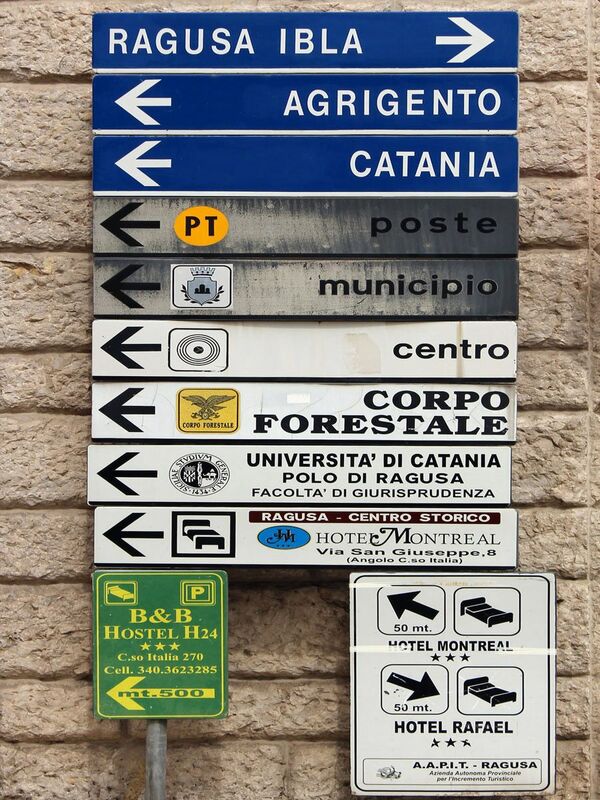 Directional signs on intersections (especially in touristic regions) tend to point to everything existing in the area. As the result it may be difficult to “filter out” meaningful signs from the commercial ones. White signs with characteristic multiple circles centered around the large dot point to the City Center! This is one of the most important signs for visitors, because usually city center is where you want to be - the Old Historical Town. Any other white signs as well as those in other colors indicate everything else (hotels, restaurants,… etc.). Theoretically it’s simple and clear, but not necessarily in Sicily where quite often all signs are mixed altogether making it looking like a good abstract painting from the collection of Jackson Pollock. In practice, when you have only few seconds (or less) to make an educated decision, you may fail to make the right one. Fortunately it is not the end of the World! Remember, Sicilians are very friendly people and they will make an extra mile (literally extra mile(s)) to help you find your way. 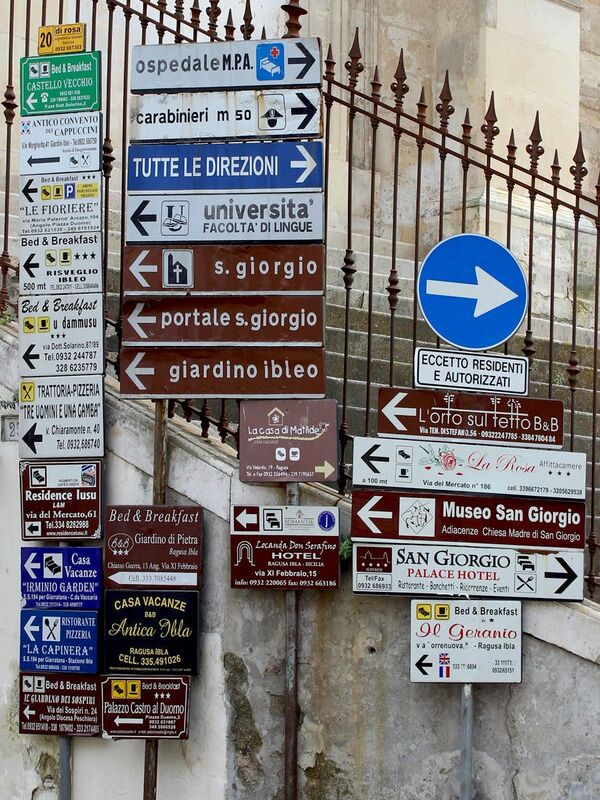 Man will spend long minutes explaining (obviously in Italian) how to get “there”. Be polite and listen even if you understand only few words. You have to be “tuned” to the most important ones like: Siempre Dritto (straight) , Destra (right), Sinistra (left)…..and correlate what you hear with what you see around. Woman will start explication but then she will quickly figure out that it is too difficult. So she will get back to her car, say Follow Me (something like “Seguimi”) and drive you to the exit from the town! Believe me, it feels good!